Missing Option: Custom Monogram & Logos 108"
A one-time price of $6,995.00 will be added to your order. Competitive Smoker Cooker on Outside Kitchen Cart. Our largest series, excellent for onsite or on location catering and commercial use. 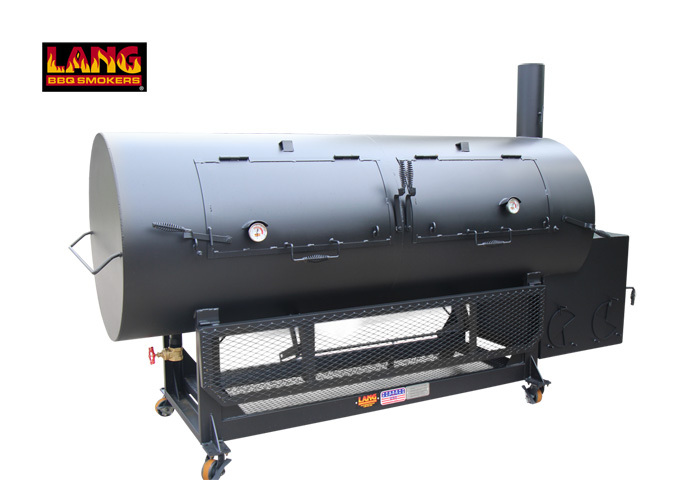 L x H x W: 125" x 76 1/2" x 40"
Bottom (3) Fixed removable Racks: 36" x 30"
Sliding (2) Upper Rack:35.5" x 33.5"
The 108" smoker cooker has 38 cubic feet of cooking space and hold approximately 500 pounds of food with room to spare. This size allows for a whole pig (approximately 200 pounds) to be smoked. Approximately 75-100 full racks of ribs can be smoked at a time. The Deluxe warmer (deluxe model only) box provides additional slow cooking capacity. No frame version for mounting in outdoor kitchen or a permanent BBQ pit at discounted price ($200 off price). Talk to us about customizing your Lang to your own needs. A complete description and other options can be seen on the web site product page. Shipping & Delivery is in addition to purchase price and is due at time of delivery.